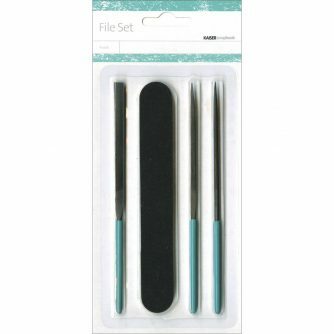 Kaisercrafts File Set contains four files in various shapes and sizes, the best accessory to your mixed media and Beyond The Page toolbox. Distressing paper, wood and other crafting surfaces is much easier with the emery style board, flat tip file and 2 pointed tip files. Kaisercrafts File Set contains four files in various shapes and sizes, the best accessory to your mixed media and Beyond The Page toolbox. Distressing paper, wood and other crafting surfaces is much easier with the emery style board, flat tip file and 2 pointed tip files.